Bring a large pot of salted water to the boil and cook the pasta in rapidly boiling water for 8 minutes only. If they are overcooked, it will be difficult to fill them. Rinse with ice cold water to stop the cooking process and drizzle with olive oil to prevent sticking. Set aside. In a medium sized pot, heat the milk, onion and bay leaf together. Remove from the heat before the milk starts boiling. Leave to stand for 5 minutes to allow the flavours to infuse into the milk then strain and discard the onion and bay leaf. In a large pot, heat the butter until bubbling then add the spinach and sauté until the spinach has wilted down. Add the flour and mix until well combined then add the infused milk and whisk continuously over the heat until the sauce has thickened (remove from the heat the minute the sauce starts to bubble). Mix the breadcrumbs and parmesan together. Pour half of the sauce into a mixing bowl. Add half of the crumb mixture, the tuna and zest. Season to taste. 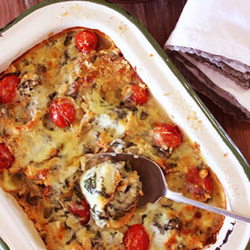 Pour a little bit of the spinach béchamel sauce in a large greased baking dish. Use a teaspoon and fill the shells with the tuna mixture and pack tightly together into the sauced baking dish. Arrange a few tomatoes in-between the shells. Pour the remaining spinach sauce over the shells and sprinkle with the other half of the crumb mixture. Bake for 35-40 minutes until golden.